What are the names of the two steamboats? Stereoview of two steamboats loading grain at the Canadian Pacific Railway elevators at Fort William. An adult watches two children play with a cat in the foreground. 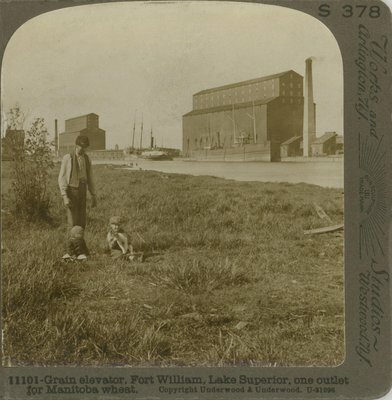 "11101-Grain elevator, Fort William, Lake Superior, one outlet for Manitoba wheat. Copyright Underwood & Underwood. U-31096" "S378"
"Underwood & Underwood, Publishers New York, London, Toronto-Canada. Ottawa-Kansas"
"Works and Studios Washington, D.C. Arlington N.J. Littleton, N.H."
"11101. Geography.--Fort William is in the Province of Ontario on the western shore of Lake Superior, about thirty miles north of the United States boundary line. We are looking across a narrow bay at one of the grain elevators of the Canadian Pacific Railway Company, and two of their boats waiting for a cargo. Products and Industries.--Transportation.-- These grain elevators are designed especially for the storage, transfer and handling of cereals. The grain is all stored in that large part of the building at the bottom, where there are no windows. That smaller section above, which looks like a little house set on top, is called the machinery in the building. A barge or vessel or cart coming to be unloaded is placed at the bottom of an endless belt of buckets in which the grain is received and carried to the top to a receiver. From there the grain is thrown into a hopper, weighed and dropped to the fott of the "lofter" or distributing legs in the main house, where it is spouted into storage bins. As the cargo is discharged, the craft, relieved of its burden, rises on even keel. Transportation.--A great deal of wheat is shipped through Lake Superior and the Sault Ste. Marie Canal, Lake Huron, Lake Erie and Lake Ontario to the St. Lawrence river, and from there to all parts of the world. Refer again to this view when considering Agriculture, People and Homes, Child Life, Home Economics.